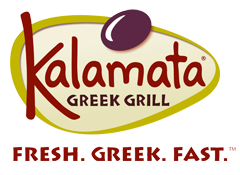 Kalamata: a totally new concept offering sensational Greek dishes in a hip, first-of-its kind fast casual environment. Our core is delicious food. You get it super fast. Customize your order as you like and watch it prepared fresh right in front of you. We're grilling our secret recipe bread all day - add in our killer Tzatziki sauce (say it with me, "Tsah-ZEE-kee"), or any of our other numerous homemade sauces and dips, and you're golden. We've been awarded numerous times for our flavor, but it's more than that. Great old-school goodness. Cool new-school experience. © Copyright 2008-2019 Kalamata Greek Grill.